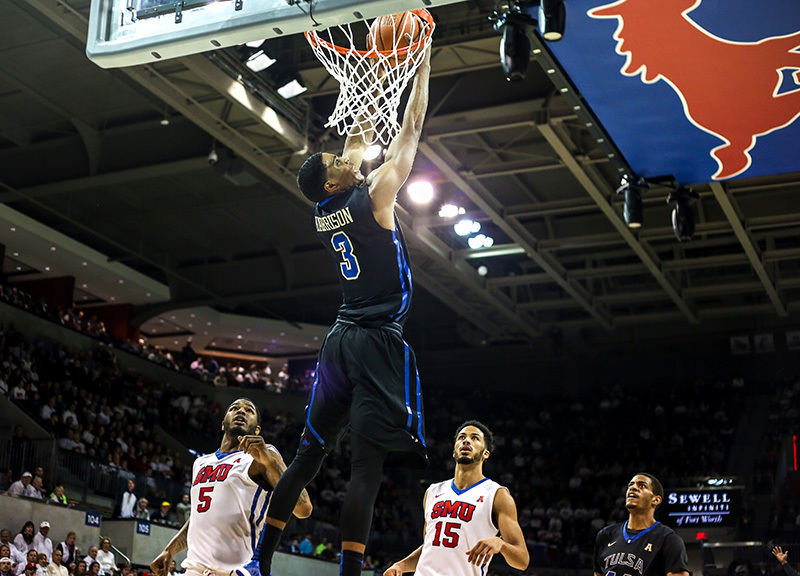 With Its 67-62 Win Over Tulsa, SMU Clinched Its First Conference Title In Basketball In 22 Years. There was ample cause for celebration once the final buzzer sounded for yesterday's men's basketball match-up at Moody Coliseum: By holding off a tenacious visiting Tulsa team for a 67-62 win, the Southern Methodist University men's basketball program cliched its first regular season conference title in 22 years. And while there would be a celebration, it would end up being fairly short-lived: Just moments after the confetti rained down on the Mustangs' home court, only seconds after the team hoisted the American Athletic Conference championship trophy and cut down the net (with senior Cannen Cunningham wearing that nylon around his neck and into the locker room), coach Larry Brown and his players seemed less consumed by their accomplishment and far more concerned with whether they'd done enough to earn a berth in this year's NCAA Tournament. Clearly, this is a team still burned by last year's snub from the NCAA Tournament selection committee — and one well aware of the fact that the American Athletic Conference's automatic tournament bid goes to the winner of its conference tournament rather than the regular-season victor. 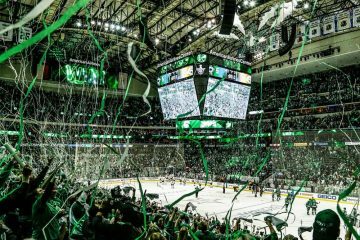 Still, this team's accomplishments aren't to be downplayed. This, after all, wasn't even the roster this program anticipated featuring this season. After last year's disappointing finish, things seemed primed to improve this year — especially with the arrival of can't-miss prospect Emmanuel Mudiay coming on board. But when Mudiay backed out of his commitment over the summer, he left the state of the seemingly promising program uncertain. 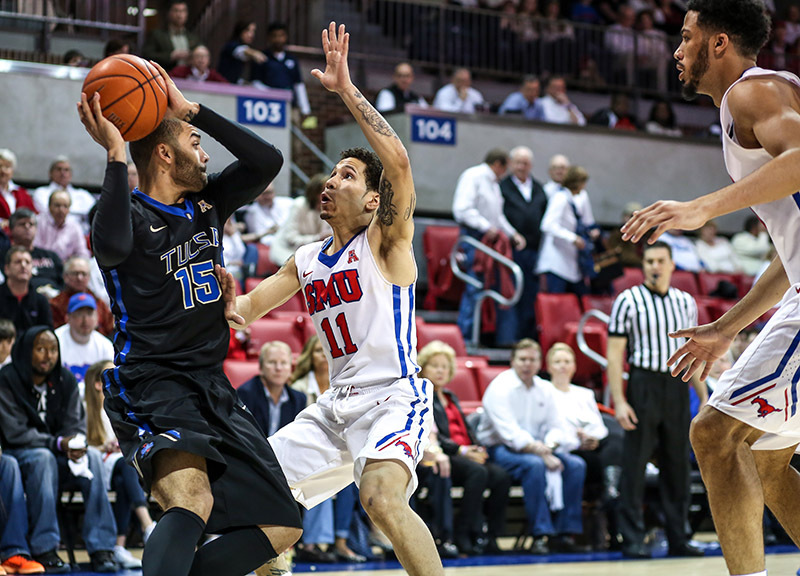 Without the high-profile prospect Mudiay — a player with whom Brown believes his team would've been among the top three in the country — SMU had to rely instead on its experience this season. Manuel’s greatest test on the day was Tulsa guard James Woodard, who hit 10 threes on the afternoon and kept Tulsa in a too-close-for-comfort position after the Mustangs took a late lead. The Mustangs rebutted with junior forward Markus Kennedy, who led the team with 16 points that included a crucial and-one play and some clutch end-of-game free throws to help seal the deal. Senior Cannen Cunningham was the real star of the day, though: Inserted into the starting lineup for Senior Day, he contributed 12 points, 12 rebounds, two steals and a block. And the win was a big one for Cunningham and his classmates Manuel, Yanick Moreira, Kevin Dunleavy and Jean-Michael Mudiay, all of whom were inherited by Brown, rather than recruited to the team under his watch. Now, however, the Mustangs are heading into the American Athletic Conference Championships with the No. 1 seed and a bye. They'll face the winner the opening-round game between No. 8 East Carolina and No. 9 University of Central Florida in the quarter finals on Friday, March 13. Until Selection Sunday comes and SMU officially earns its entry into the big dance, though, neither Brown nor his players will be able to rest easy. 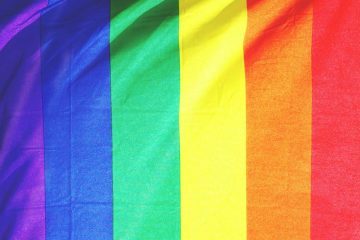 But they should rest proud. 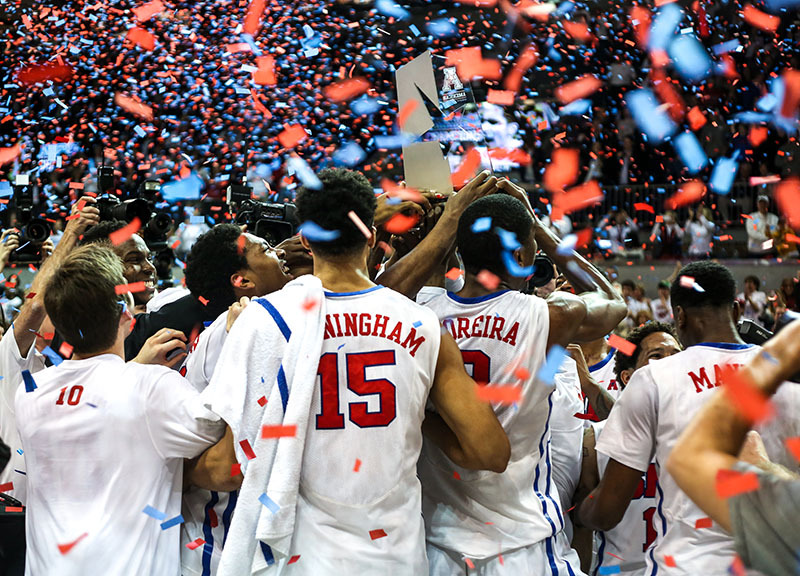 For all their doubts, it now seems like a lock that SMU will be in the NCAA Tournament. The only real question now, is what seed they'll be given. 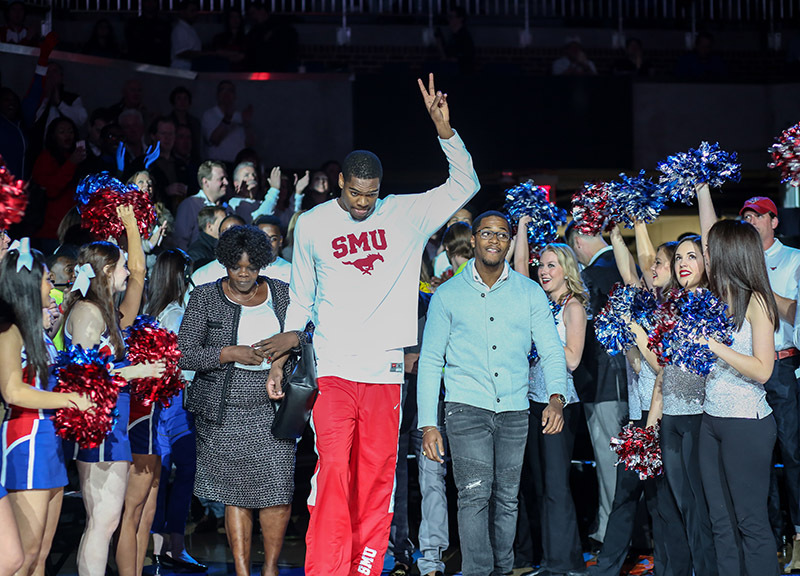 SMU forward Yanick Moreira is honored on Senior Day. Cannen Cunningham, Ryan Manuel, Kevin Dunleavy and Jean-Michael Mudiay were the other seniors honored. 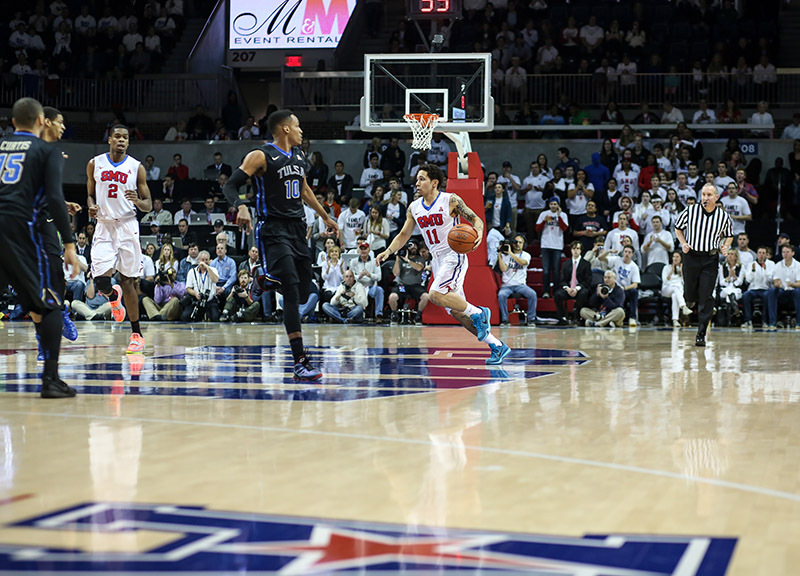 SMU guard Nic Moore pushes the ball up the court. Moore finished the game with 14 points, five rebounds and three assists. 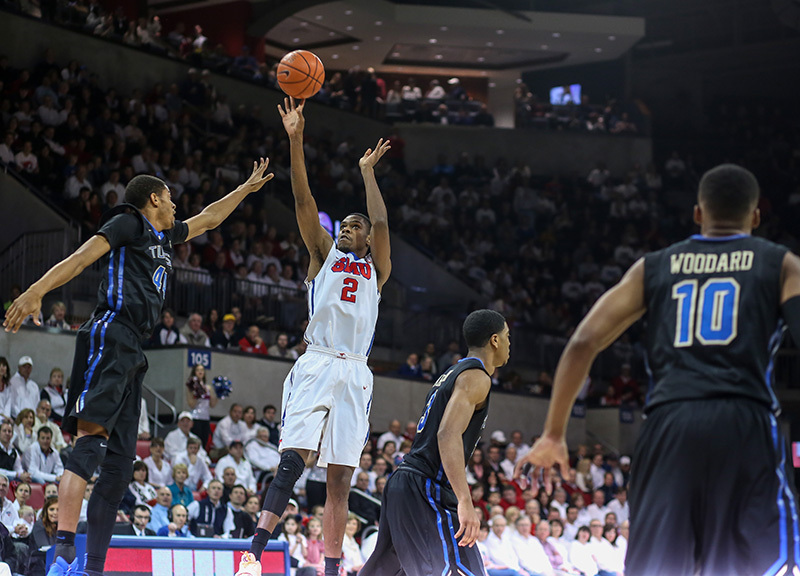 SMU forward Yanick Moreira shoots a jumper in the first half against Tulsa. Moreira Moreira scored four points in the contest and in the post game admitted to letting his emotions get to him in his final game. Swannegan. Kennedy and Swannegan battled under the basket all afternoon. 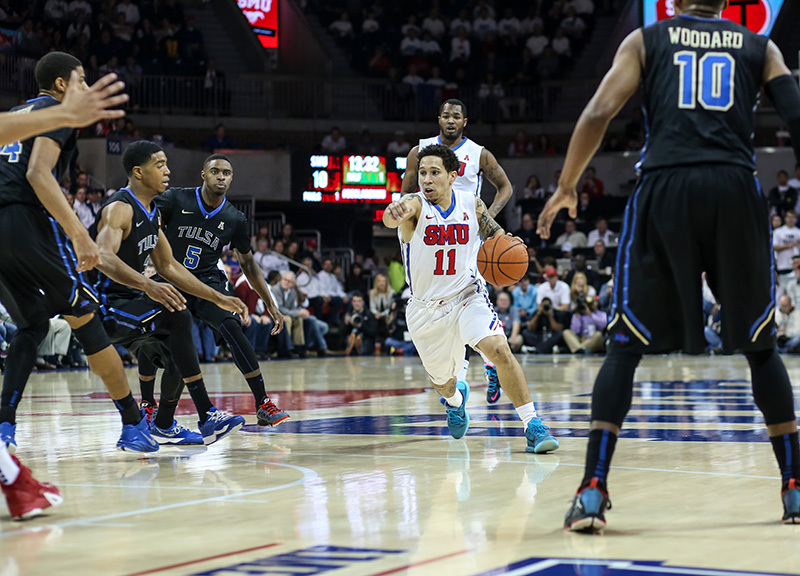 SMU guard Nic Moore directs play as he comes up the court. Moore scored 10 or more points in a game for the seventh straight game. 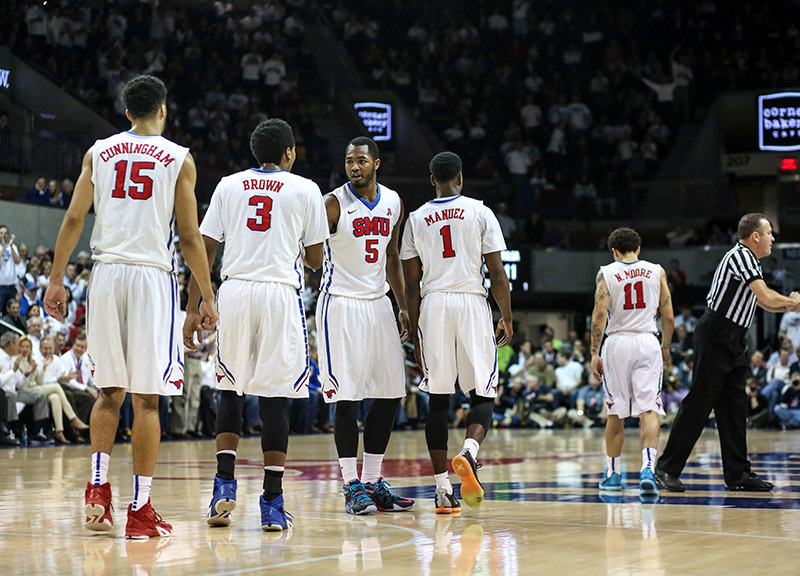 The SMU startling lineup talks game plans during a timeout. Senior Cannen Cunningham earned a start in his last home game. Tulsa guard James Woodard loses his balance. 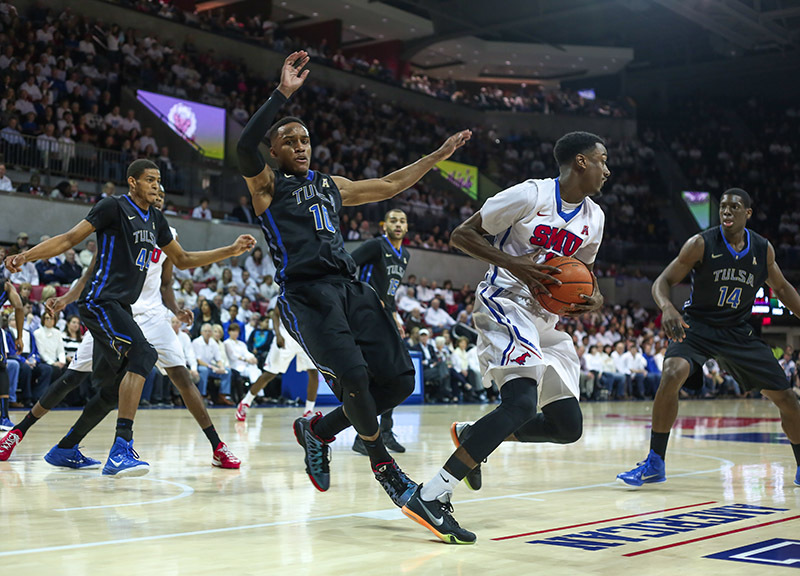 Woodard torched SMU for ten three pointers on Sunday. 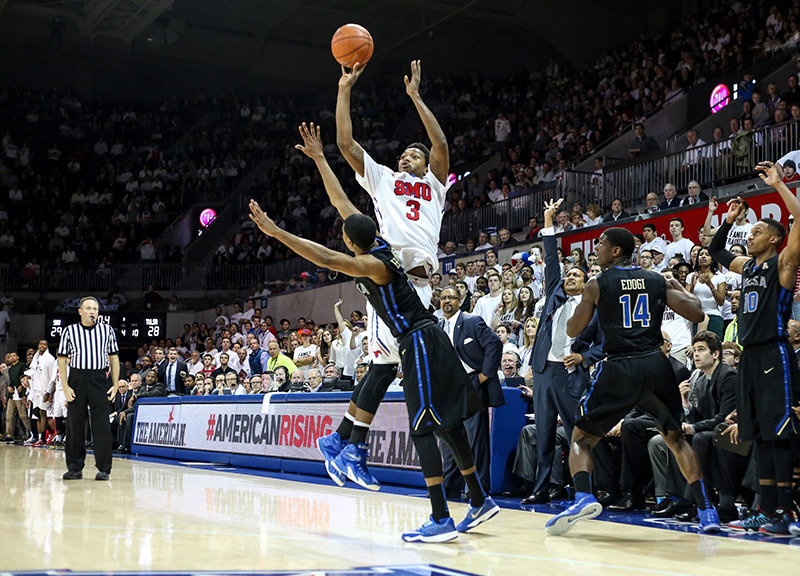 SMU guard Sterling Brown attempts a three pointer against Tulsa. Brown scored eight points. 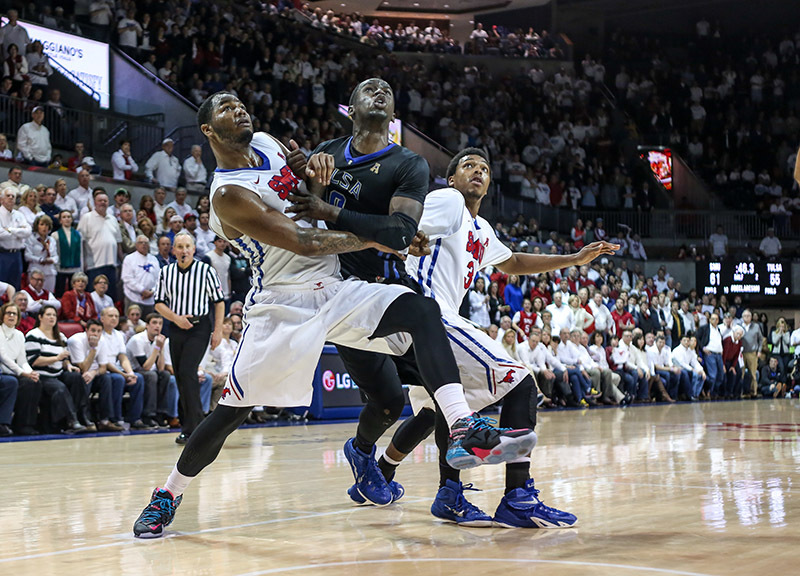 SMU guard Nic Moore defends Tulsa guard Marquel Curtis. Curtis scored six points against the Mustangs. Tulsa guard Shaquille Harrison slams home a reverse dunk against the Mustangs. Harrison finished the game with ten points and nine assists. 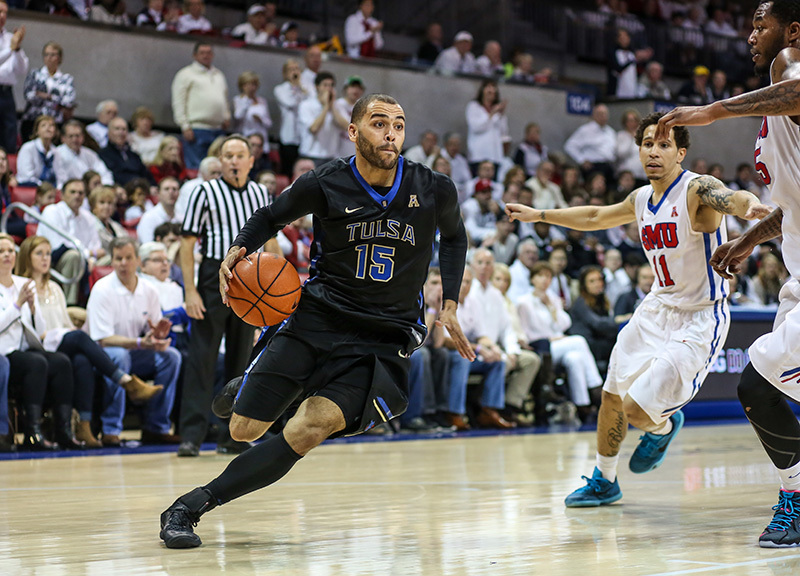 Tulsa guard Marquel Curtis drives the baseline against the Mustangs. 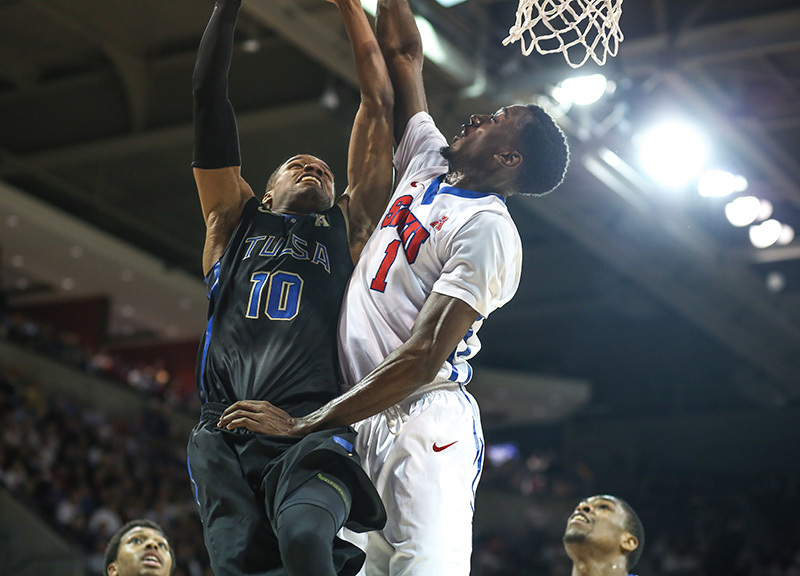 SMU guard Ryan Manuel and Tulsa guard James Woodard battle at the rim. Manuel finished the game with nine points, four rebounds and three assists. 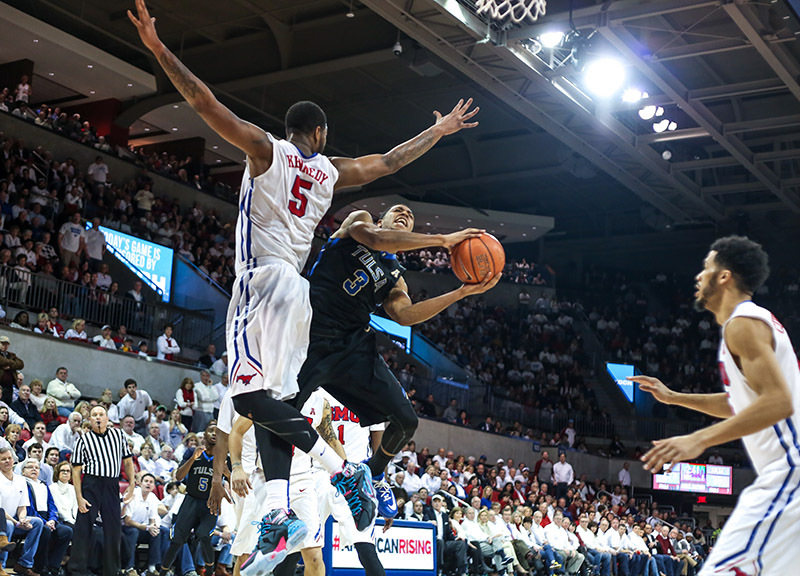 SMU forward Markus Kennedy challenges Tulsa guard Shaquille Harrison’s shot. Kennedy led the Mustangs with 16 points. 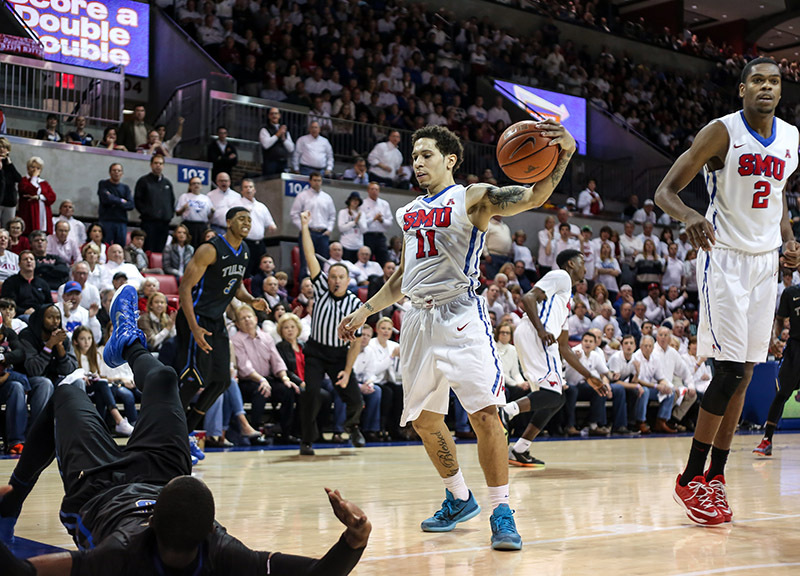 SMU guard Nic Moore stares down a Tulsa player after battling for a loose ball. 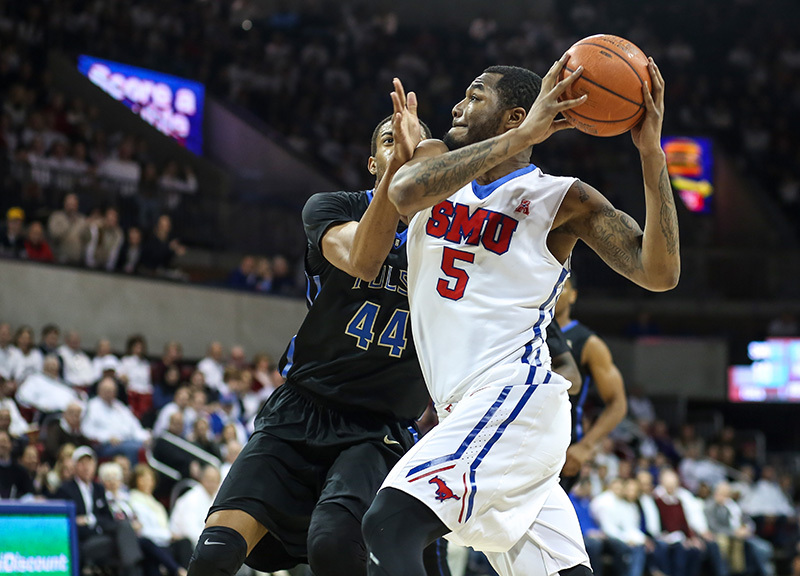 SMU forward Markus Kennedy battles under the basket after a free throw. Kennedy recorded seven rebounds and three blocks. 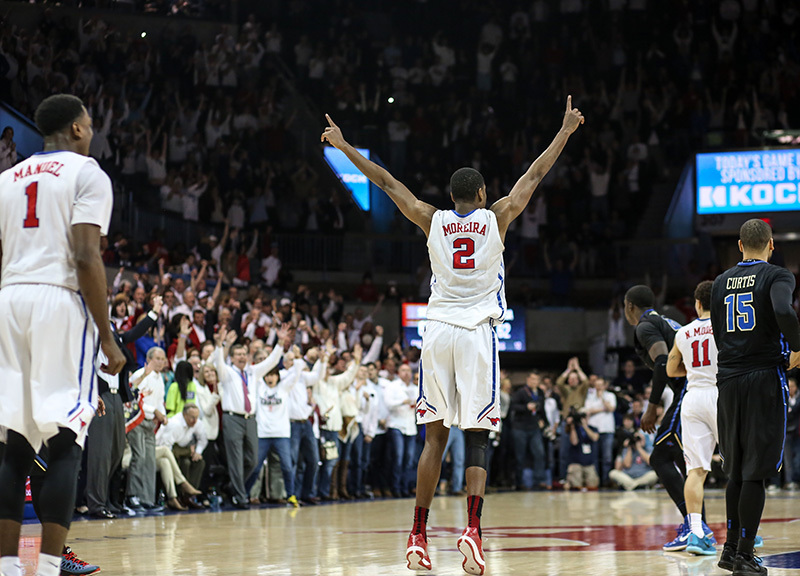 SMU forward Yanick Moreira celebrates his teams’ 67-62 victory over Tusla for the conference title. 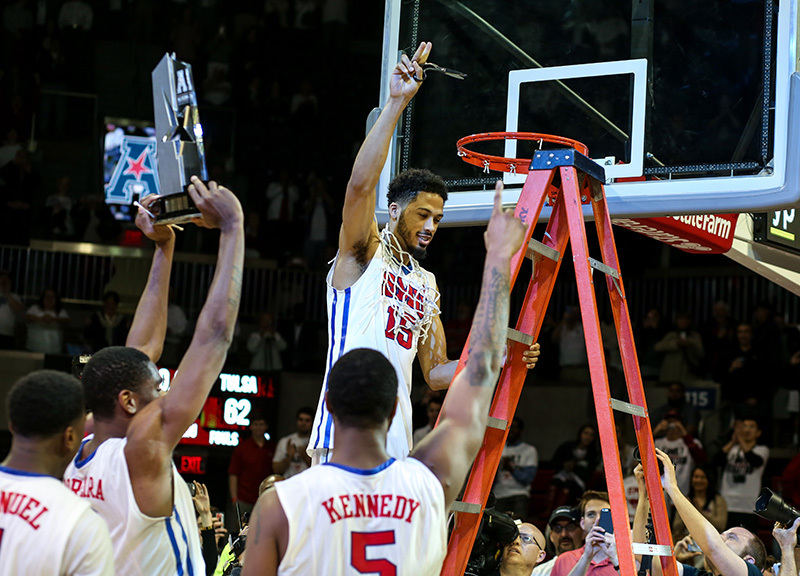 The SMU Mustangs hoist the American Athletic Conference championship trophy in Moody Coliseum. 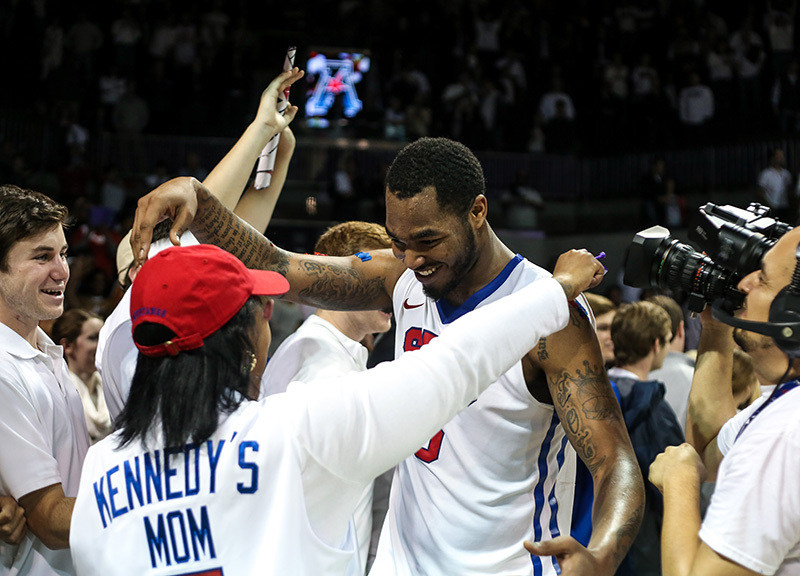 SMU forward Markus Kennedy celebrates with his mom after the game. SMU forward Cannen Cunningham cuts down the net in celebration of the Mustangs’ first conference title since 1993. 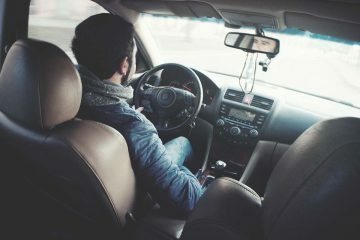 Next ArticleBack To The Future.